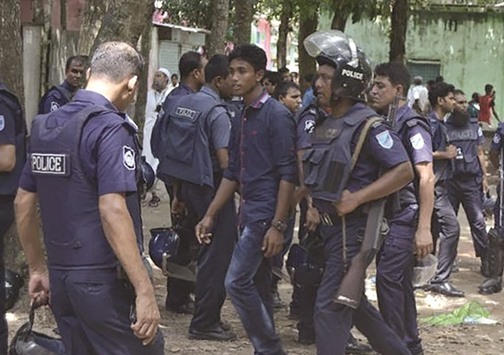 Police detain a suspected militant following an attack near Bangladesh’s largest Eid prayer rally in Kishoreganj, some 130km from Dhaka yesterday. Suspected militants carrying bombs and machetes launched another deadly attack in Bangladesh yesterday, killing at least three people at a huge prayer rally marking the start of Eid. Days after a mass murder of hostages in Dhaka, authorities said two policemen and a civilian were killed in explosions and gunfire near a prayer ground in the northern Kishoreganj district. One of the attackers was also shot dead and four of his suspected accomplices were arrested after hand bombs were hurled at police manning a checkpoint just outside the main prayer ground. 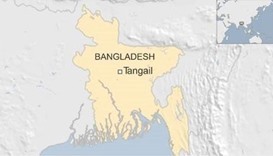 “Two policemen, an attacker and a woman who was shot during the (subsequent) gunfight were killed,” national police spokesman A K M Shahidur Rahman said. Weapons recovered from the scene of the attack, close to where a quarter million people had been taking part in a post-Ramadan gathering, included a pistol and machete. The prayer gathering in Kishoreganj is by far the biggest such congregation in Bangladesh, a mainly Muslim country that is home to around 160mn people. 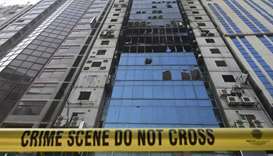 While there was no immediate claim of responsibility, the attack came less than a week after militants killed 20 hostages and two policemen in an overnight siege at a Western-style cafe in the capital Dhaka. 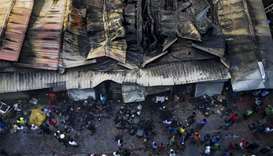 Many of the victims, which included 18 foreigners, were hacked to death with machetes. 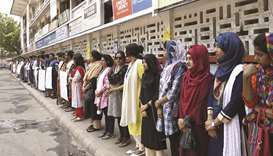 Bangladesh has been on a heightened state of alert in the wake of the killings in Dhaka last Friday night and many Eid services included pleas from religious leaders for an end to the violence. The cleric who led the Kishoreganj prayer, Maolana Farid Uddin Masuod, has been an outspoken critic of a recent wave of attacks by extremists and he again strongly condemned yesterday’s killings. “The young men who think they will go to heaven (by carrying out such attacks) are wrong. 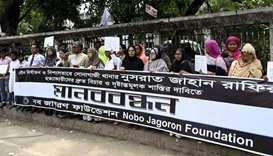 They will go straight to hell,” Masuod said. 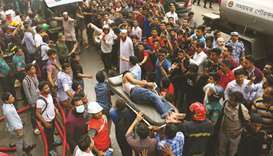 Many of those who attended services in Dhaka could be seen weeping as clerics led prayers for a more peaceful and prosperous Bangladesh. 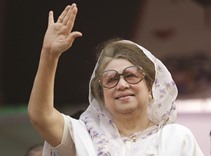 The biggest service in the capital was at the National Eidgah Maidan where more than 50,000 people, including Bangladesh’s President Abdul Hamid, took part in prayers under a giant canopy. Police brought in scanners and sniffer dogs to check for bombs as crowds were forced to wait for up to an hour before being cleared to enter the grounds where the service was held. No one was allowed to bring in bags. 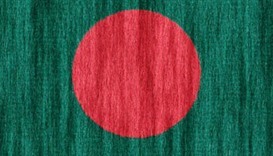 Bangladesh has been reeling from dozens of attacks since the turn of the year, mainly targeting secular activists or religious minorities. Many of them have been claimed by the self-styled Islamic State group or an offshoot of the Al Qaeda network. 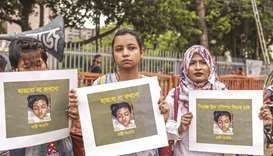 However Prime Minister Sheikh Hasina’s government has consistently denied international militant networks have gained a foothold and has said the weekend attack in Dhaka was carried out by a local group. 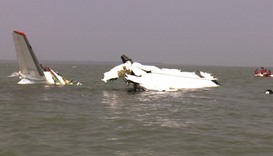 Bangladesh’s Information Minister Hasanul Haq Inu again portrayed the latest attack as being designed to topple Hasina. “We don’t know which group they belong to but they are suspected members of extremist terrorist group. 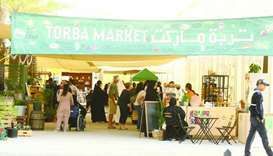 They are against the normal religious practices of the country,” he said. The violence threatens lives as well as the country’s economic well-being. The country depends heavily on its $26bn garment export sector and insecurity is making foreigners nervous. “It is a persisting trend of going against principles of Islam,” Zamir said. 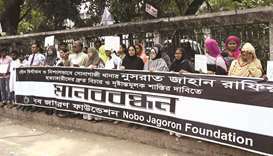 Critics have said Hasina’s administration is in denial about the nature of the threat posed by extremists and accuse her of trying to exploit the attacks to demonise her domestic political opponents. Last month, authorities launched a crackdown on local militants, arresting more than 11,000 people, but critics allege the arrests were arbitrary or designed to silence political opponents. 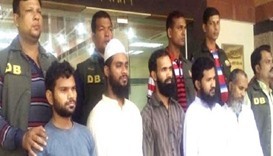 Bangladesh’s main Islamist party has been banned from contesting polls and most of its leaders have been arrested or else executed after recent trials over their role in the 1971 war of independence from Pakistan. 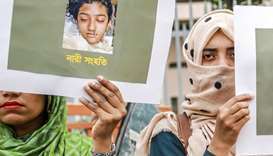 Islamic State has warned that the violence would continue until Islamic law was established worldwide, saying in a video that the Dhaka assault was just a hint of what was to come.